André, Victor, nice to meet you! You’ve been working at Sigma Technology for several months now. We would like to get to know you better. Would you please tell us about your background? André: I study System Science Program with a focus on business development at the Linnaeus University in Växjö. I got in touch with Sigma through our internship course supervisor. I was looking to learn more about programming and system development, and Sigma Technology was one of a few companies, which could offer such an opportunity. 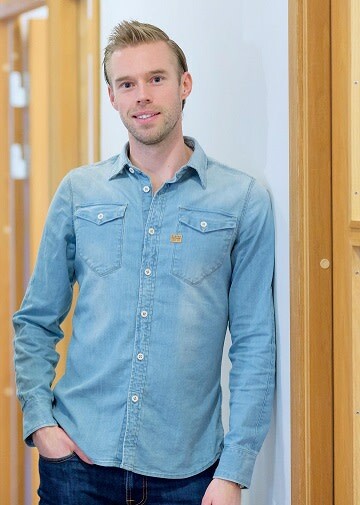 Victor: I study the same program and I found my internship at Sigma with the help of Jonas Jansson, who was responsible for connections between the Linnaeus University and IT corporations in Växjö. 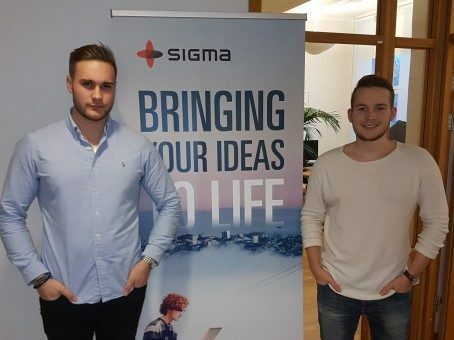 I started to research what I wanted to do and found Sigma Technology to be a qualified company offering an internship in the area I wanted to try. Can you tell us more about the project you work on? Victor: My internship at Sigma Technology lasts from August 29, 2016, to January 6, 2017. The mission consists in working with the technical documentation for IKEA of Sweden. This means that I, together with colleagues at Sigma Technology and IKEA of Sweden, analyze, process, and refine technical documentation for various products of the customer. In the beginning of the internship, my work mainly consisted in learning how to deal with a computer-based word processor to write in a professional, clear, and simple way. The information I need to process mostly includes technical documentation, for example, specifications and requirements for product design (PDR). After the initial knowledge sharing I started and now continue on delivering technical documentation to IKEA. André: I am a part of the project that aims to develop a solution for using DocFactory (DF) in different IoT projects. Internet of Things (IoT) is a collective term for the development, which implies that machinery, vehicles, goods, household appliances, clothes and other things, as well as living beings, interact with each other using small built-in sensors and processors. This means that these devices can perceive their surroundings and communicate with them, thus creating a situational behavior. They help to create smart, attractive, and helpful environment, goods, and services. DocFactory, CMS in the cloud, can add value for IoT users through its interactive information, which is presented in real time. The system displays only the information that is relevant to how the surroundings look like in a particular period of time. So far I have read about the IoT and developed a model that describes how an IoT solution might look like and where DF fits into the whole. At the moment, I am developing a web application to communicate with the IoT platform Yodiwo through a WebAPI. The foundation of the web application and WebAPI message is created, what remains is to create a contact between my WebAPI and Yodiwo’s API. Thus, I’ll be able to collect data from various sensors connected to Yodiwo’s platform. After that, I need to retrieve topics from DocFactory depending on what sensor values show. André, do you see how your application can improve business? How and in which industry? André: The web application can be actually used in any industry, as long as there is a need to retrieve and display various readings and “intelligent information” that is linked to different states of the values. You can take a manual of any machine as an example: If everything is ok with the machine, you do not read the manual, then the web app will have no information and only show that the values are green. However, if anything happens to the machine, or is about to happen, the app will show the parts of the manual that are needed at that particular moment. André: My biggest challenge has been to learn everything I need in order to create this application since I have never made anything similar to this one before. Victor: My biggest challenge so far has been to change the way I am used to writing texts, information, and documentation, etc. Throughout all my life I have been indoctrinated to write in a very detailed and broad way, we have been taught to write nuanced. When working with technical information, you have to be very short, concise, and clear in your writing, and for me changing the writing style was the biggest challenge. Victor, how does it feel so far? Victor: It feels incredibly good to have the opportunity to work with both IKEA and Sigma. Even if I am not in direct contact with the team working at IKEA, I still have a good insight into how they do business, which I highly value. To get an opportunity to do an internship while studying at university is incredible. To be able to work with Sigma team is truly fun and educating, which feels amazing and very rewarding for my future career. Thank you, André and Victor, it was nice talking to you! We live in the age of information and globalization. Having access to information at any moment and via any useful device is essential and creates a new level of comfort in professional and personal life. Creating an IoT web application to be connected to DocFactory CMS is another step in building seamless integration between the information system and smart devices around us. Working on technical capabilities, we should not forget about the quality of the information itself. Victor’s project is just as important as the one of André. Accurate and precise information is the core of the information system. We work on IoT integration and content quality through many directions and hope you will experience the benefits of our efforts in the areas of Internet of Things, embedded development, and content management.